Cast a creative spell over your home kid-art studio. Mom Jessica of Scrumdilly-Do! shares this fun way to introduce etching to young kids with exciting results! Break out the crayon box and set them to work drawing patterns on a piece of cardboard or cardstock, then apply a coat of acrylic paint over the paper. 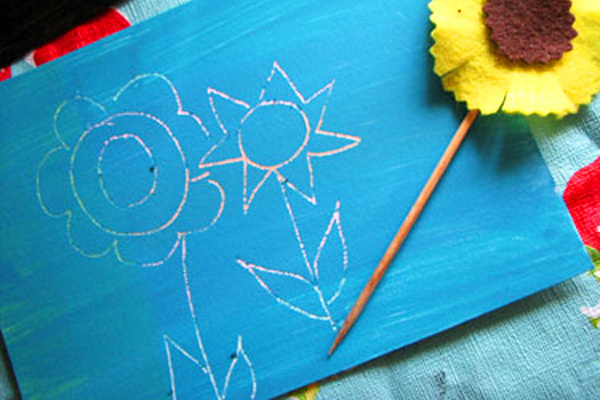 Once the paint has dried give your kids chopsticks, toothpicks or knitting needles to etch out vibrant, magical drawings. 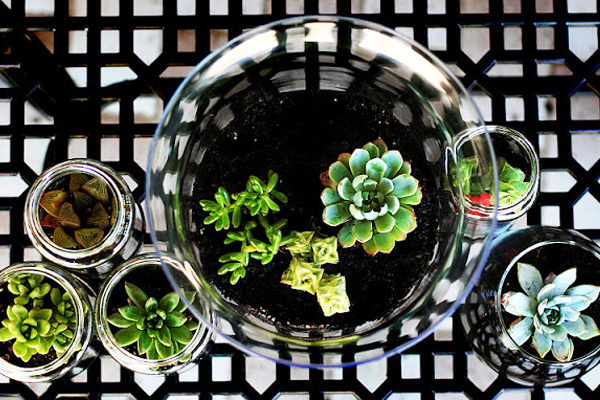 Terrariums and succulents are all the rage! If you're hoping to get your little green thumbs involved with making your own adorable planters, take a tip from the lovely ladies at Eighteen25. It’s a quick and easy project that can be completely personalized and done indoors or outdoors – and a great introduction to planting and gardening for young children. Plus, succulents are easy to care for and keep alive – always a bonus for beginners! 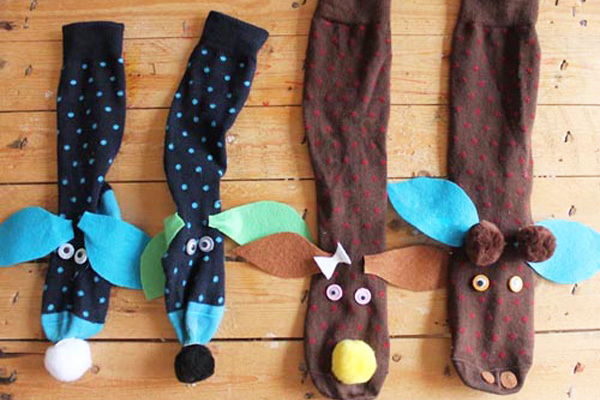 Bring old socks back to life as crazy-cute sock puppets like these adorable ones featured on Babyccino Kids! Easily made with glue, felt, googly eyes, buttons, pom poms, yarn and other fun facial feature materials, these sweet socks inspire creative play and last well into the future. 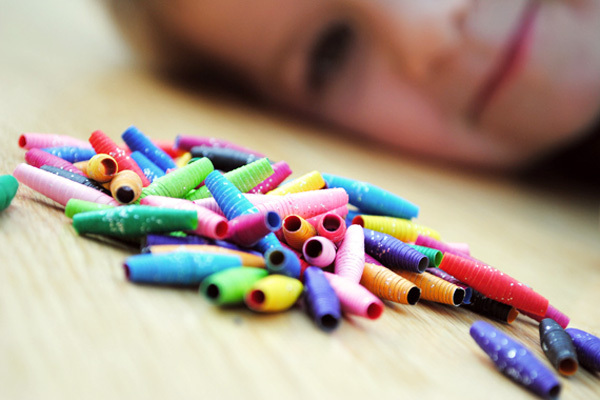 Perfect for rainy day play or when you’re in need of a quick and easy boredom buster! Treat your piccola fashionista to a day of jewelry making with Mini Eco’s great tutorial on DIY paper beads. Noted as being “easy to make and surprisingly sturdy,” these gorgeous paper beads can be used for friendship bracelets, necklaces, key chains and beyond. Mom Kate says that for these beauties she used colorful sheets of origami paper, but that magazine pages also work. Check out the rest of her post for the full walkthrough and more photos! 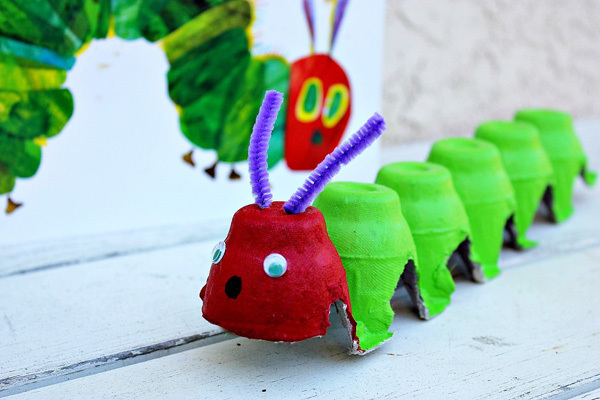 Guest poster Tonya Staab shares a quick and easy tutorial on Rusty and Rosy for creating everyone’s favorite six-legged storybook critter – The Very Hungry Caterpillar! Not only is this colorful project a great one for small hands, it offers learning opportunities about insects, life cycles and the beautiful butterflies that caterpillars become! Learn more about what you’ll need to get started by visiting the full post. 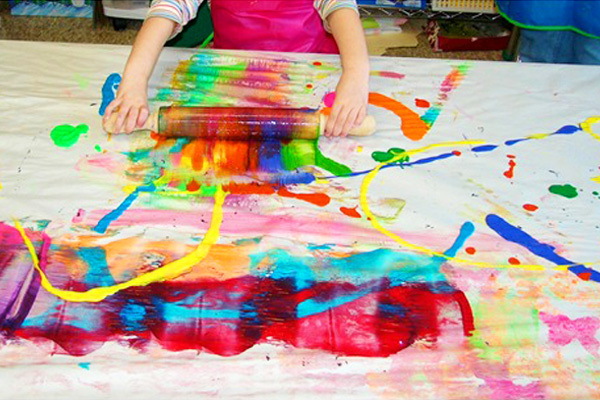 Put your kitchen rolling pin to the test as a paint applicator for an afternoon with the help of this neat idea from Casa Maria’s Creative Learning Zone. A cool idea for making grand masterpieces with a funky tie-dyed look, this art project is good for groups of kiddos, and can be done on a large or small scale. And who says the rest of the kitchen utensils can’t join in? Consider using potato mashers, silverware and other ordinary tools to make textures and prints. Have a crafternoon. 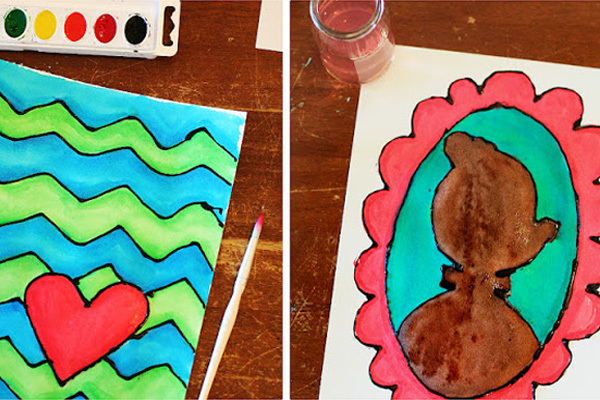 Check out this crafty-cool coloring idea featured on Eighteen25! By adding a little black paint to a bottle of Elmer’s Glue, your kids can create cartoon outlines to color in with paints, crayons, markers or pastels. 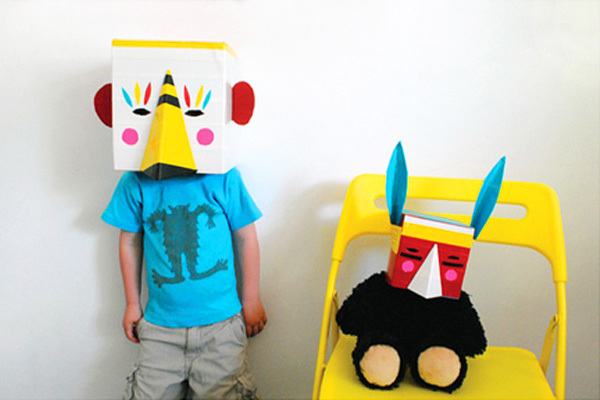 A great project for all ages and one that’s sure to keep kids crafting all afternoon. Mom Jean of The Artful Parent shares the perfect idea for refreshing leftover craft materials, all while creating an exciting new one-of-a-kind art piece with these awesome DIY wire sculptures. 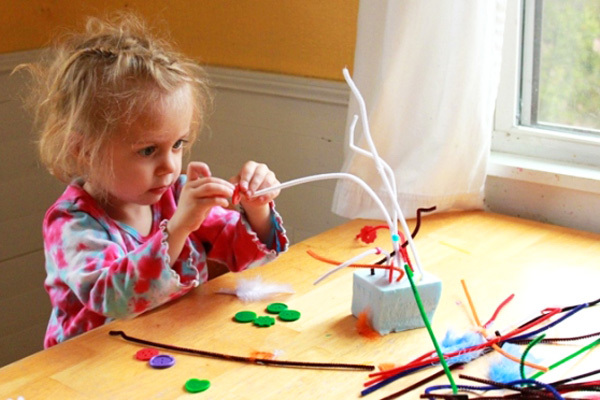 Easy to make and a great activity for kids of all ages, these sculptures can incorporate a variety of textures and 3D materials – including buttons, feathers, pipe cleaners, bring it! Jean says this was a great project for her six-year-old and toddler! Get rockin’ and rollin’ – with marbles, that is – with this neat art project featured on Colour Her Hope. A fun activity for younger kiddos, this project only requires marbles, paints, and a baking tin or box to contain your masterpiece. 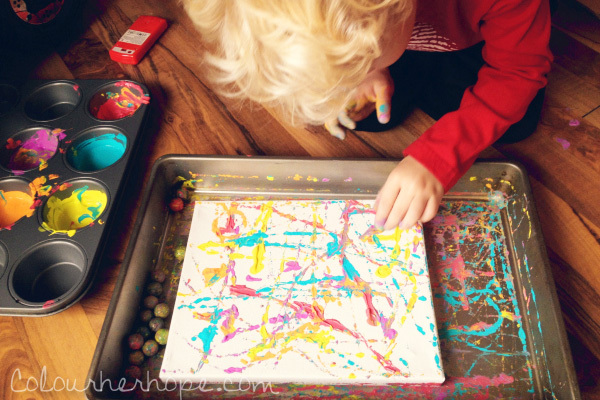 Simply roll marbles in some paint, plop them onto your canvas (or paper) and begin moving the container around to create a unique Jackson Pollock-esque creation. Surely one activity that’ll entertain for an afternoon and become a fast favorite!